“Well she just walked in, blonde hair,” I tried to explain. “That’s the one,” said I. And there she was flipping through a book, looking at jewelry, and the other entire cool overpriced stuff. She was easy to find because she stands out in a crowd – that’s simply how beautiful and unique she is. We meandered sometimes checking out their products but mostly viewing the decorations and winter theme displays because they are so wicked creative and intricate, it’s like an art gallery. 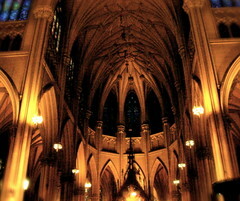 We made our way back on the streets and decided to visit St. Patrick’s Cathedral since we still had time to kill. I’d been here once when I was a kid, dragged from one tourist site to the next by my dad. This time though, I walked in with a similar awe and marvel at it’s beauty as I just had in the retail store. Odd, I know. There were your average amount of tourists skirting pews, and others who came to sit in meditation, in prayer. What is so striking about the place is how you step off one of the loudest, busiest streets in NYC right into this massive sanctuary of silence. Whether it is by virtue of the place or visitor’s respect for the devout, there is a constant hushed silence. A true sanctuary in the middle of a loud, demanding, wearing city. Unlike the Christmas themed retail store we had just left, this place was filled with enormous spaces, shadows, dimly lit, in part by the numerous prayer candles to different saints. I saw one woman near the front on her knees in such an intense posture of prayer, eyes winced in anguish. Just ten feet from her was a Russian family taking pictures of themselves before the nativity. Contrast indeed. I wonder how many people entered those heavy doors looking for something and just how many entered to look at something? I didn’t know it ‘till I was in there but I needed that kind of silence in my life for that brief moment. Life had been going loud and fast the previous few days and there were moments, in the sanctuary, strolling around where I could hear God saying stuff, good stuff I wouldn’t have heard very well outside those walls. I had entered to look at the place not expecting to find Someone. In contrast I had entered Anthropologie looking for someone not expecting to be caught up looking at the dynamic art lining the ceilings and walls. Beautiful in both their way. Maybe that’s the trick of Christmas. Shepherds go looking in a smelly stall to meet God. And yet, there was this extravagant pre-show in a field with Angels that scared them in awe, just hours before. Can’t help but notice that it is the unexpected places where God is found… and sometimes that happens in a retail store, sometimes it can even happen in church… a rarity in my experience.